Chicago, Illinois, October 29, 2007 -- Tom Day has provided photographs to The Middle Horn Leader of a very unique bugle that he received from David Monette. 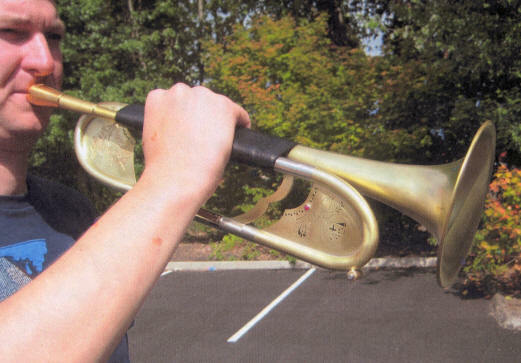 The B-flat field trumpet (pictured below) was fabricated by Monette Corporation to celebrate Bugles Across America (Web Site) and all American veterans and their families. Bugles Across America is an organization formed by military veteran and drum corps veteran Tom Day of Chicago, Illinois, who helps organize buglers to perform at military funerals across the United States. The Monette field trumpet was exhibited in the sixth annual Collaborative Artists show in Portland over Labor Day weekend in 2007. The event is known as "Art in the Pearl" and features artists in various media. The Monette field trumpet was part of the 2007 Art in The Pearl event in Portland. The collaboration project between Tami Dean and David Monette was entitled "A 21st Century Bugle to Honor American Veterans and Their Families." Photo by Randy L. Rasmussen. The instrument features cutouts and jewelry accents by Tami Dean, an artist who has performed similar work on some of Dave Monette's most notable ornamented instruments. As with other Monette instruments featuring art work, the images incorporated into the field trumpet are relevant to the owner. An engraving depicting bugler Oliver Wilcox Norton and General Daniel Butterfield adorns the back bracing of the instrument (see below). American Civil War General Butterfield and Bugler Norton are believed to have adapted an existing bugle call to create the music that is known as "Taps." 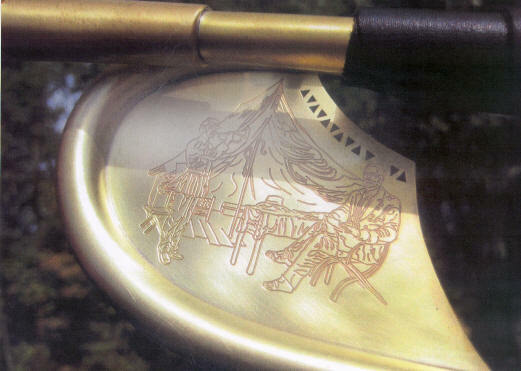 The instrument features an engraving depicting Bugler Oliver Wilcox Norton (l) and General Daniel Butterfield (r) of the Third Brigade, First Division, Fifth Army Corps, Army of the Potomac. The two are believed to have adapted existing music in July, 1862 to create what is currently known as "Taps" and is most notably used in North American military funerals. The twelve triangles depict the first twelve of the twenty-four notes of "Taps." Additional engraving and inlaid precious stone carry on the theme of "Taps" (the twelve triangles represent the last twelve notes of "Taps"). 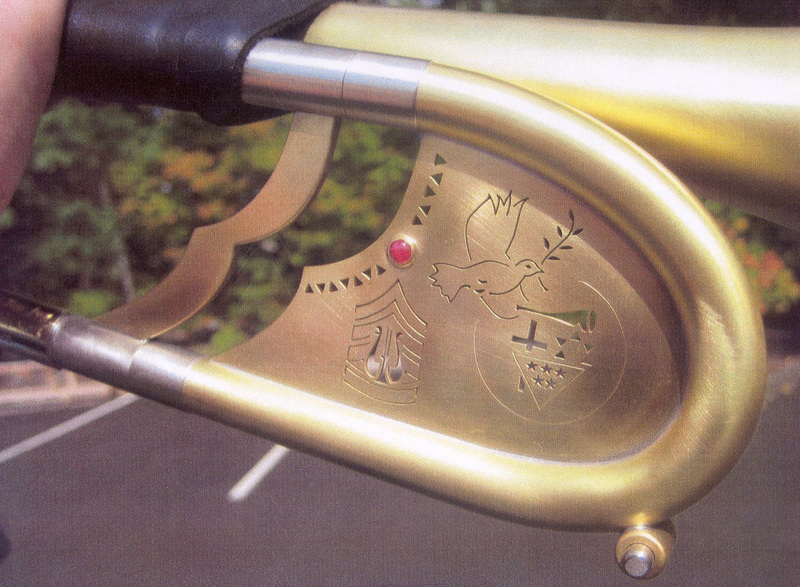 The Bugles Across America logo is depicted with a Peace Dove. Tom Day's rank and musician designation is also depicted. Is it possible a Monette mellophone could be next?! Click here to view a QuickTime movie of the instrument being played. In January 2000, Congress passed legislation guaranteeing Veterans the right to at least two uniformed servicemen, a flag ceremony, and the playing of TAPS at their funeral. Unfortunately, there are not enough buglers to play TAPS, so the historic melody has been played on a CD player at many Veterans' last ceremony. Tom Day decided that wasn't good enough for those who had sacrificed so much for their country, so in November of 2000 he founded Bugles Across America, with the goal of providing TAPS played by a live bugler at every Veteran's funeral. To this end, we are actively seeking volunteers to provide this valuable service to Veterans and their families. 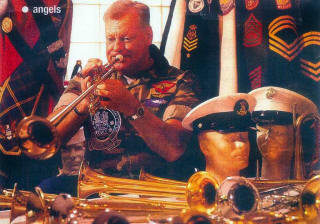 Tom Day is a tireless advocate of drum and bugle corps and TAPS ([pictured here from an article in People Magazine in 2002). Tom started playing TAPS when he was in a drum and bugle corps since the late 1940’s. He was awarded numerous citations and commendations. Tom’s work with groups of all ages, has been recognized by all levels of government and other nations. The Elks sponsor BAA and send money to fund our program. Bugles Across America now has over 5000 bugler volunteers located in all 50 states and a growing number overseas. Since the Department of Veterans Affairs is expecting more than 1/2 million veterans to pass every year for the next 7 years, Bugles Across America is ALWAYS recruiting new volunteers. Anyone can volunteer as a BAA Bugler. They can play a traditional bugle with no valves, or they can perform the ceremony on a Trumpet, Cornet, Flugelhorn, or a 1, 2 or 3 valve bugle. The bugler can be of any age as long as they can play the 24 notes of Taps with an ease and style that will do honor to the Veterans and their families. According to David G. Monette, no additional copies of this instrument type are to be fabricated. To participate in Bugles Across America, visit their Web Site.